"The Central Police Station compound is a remarkable jewel in the heart of Hong Kong, which is poised to assume a tremendously significant role in the cultural life of a city which I love. We are dedicated to offering the best heritage and arts experiences to Hong Kong and to cultivating knowledge and appreciation of contemporary art, performing arts and history in our community." As Director of Tai Kwun, Timothy Calnin is responsible for guiding a team of passionate professionals in developing Tai Kwun into Hong Kong’s best-loved destination for heritage, arts and lifestyle enjoyment. 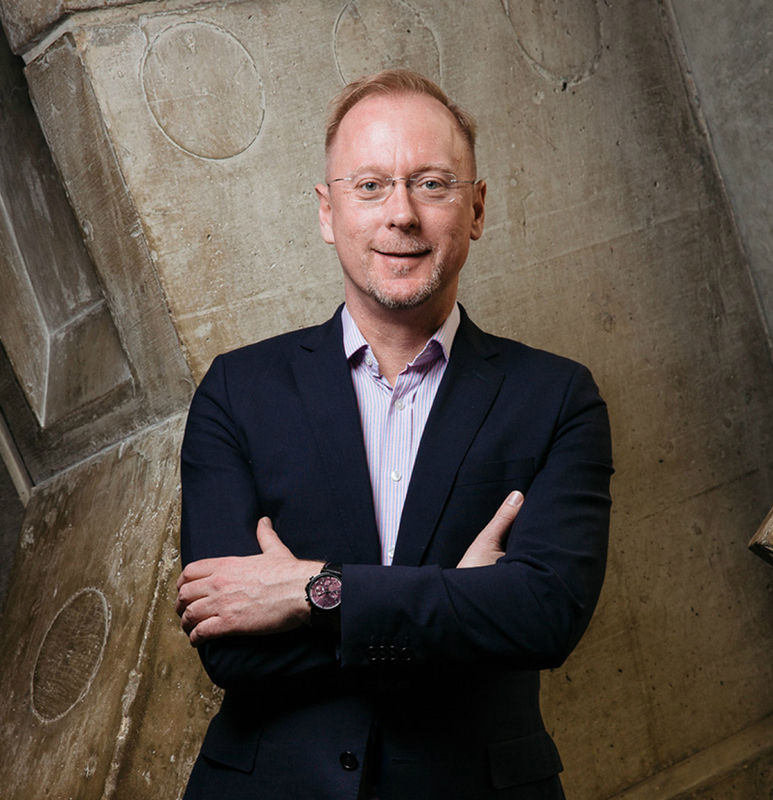 Timothy Calnin has held senior positions with leading musical and artistic organisations in Australia, Europe and Asia, which included senior executive roles at the Sydney Opera House, the Australian Chamber Orchestra and the Hong Kong Philharmonic Orchestra. Bringing Tai Kwun to life requires different teams — composed of experienced professionals in Heritage, Contemporary Art, Performing Arts, Marketing and Communications, Asset Management, Facilities Management, Information and Communications Technology, Corporate Services, Operations, Human Resources and more. These various teams are committed to a single vision — to make Tai Kwun the Centre for Heritage and Arts, a place of inspiration, stimulation and enjoyment for all Hong Kong people. The Hon CHAN is a deputy to the National People's Congress of China and the Convenor of the Non-official Members of Hong Kong's Executive Council. He is also a former member of Hong Kong's Legislative Council (1998–2008). A graduate of Pomona College in California, the United States, he is the President of Asia Financial Holdings Limited and Asia Insurance Co. Limited. He is Chairman of the Committee on Reduction of Salt and Sugar in Food, Chairman of the Steering Committee on Restored Landfill Revitalisation Funding Scheme, Chairman of Hong Kong Palace Museum Limited and Chairperson of the Hong Kong Council of Social Service. He is also Chairman of the Hong Kong - Thailand Business Council and an advisor to Bangkok Bank (China) Co. Limited. Mr CHAN chairs the Art Working Group of the Central Police Station Revitalisation Project. Mr CHA is the Chief Executive of Grosvenor Asia Pacific and has been a property investor and developer in the Asia Pacific region during his 20+ year career in the industry. Mr CHA has had a long standing interest in contemporary art and has been a long term supporter of the development of art and cultural institutions in Hong Kong. Mr CHA serves as Vice-chairman of the Asia Art Archive and is a Member of the Board of the M+ Museum for Visual Culture. He serves on the Asian Council of the Serpentine Galleries and previously served on the Tate Asia-Pacific Acquisitions Committee. Mr CHA has a Master Degree in Business Administration from Stanford University and a Bachelor Degree of Arts in International Politics and Economics from Middlebury College, the United States. Mr CHA is a Member of the Art Working Group of the Central Police Station Revitalisation Project. Ms CHENG, a Member of the Central and Western District Council, has been following heritage conservation in the community for many years. She is the Chairperson of the District Facilities Management Committee and the Member of the Working Group on Concern over the Development of the Central Police Station Compound and Former Police Married Quarters under the District Council. Ms CHENG is a social worker. Dr LEE is a founder and the longest serving Director (2006-2015) of the Architectural Conservation Programmes in the Faculty of Architecture of The University of Hong Kong. A well-published academic and an experienced practitioner in built-heritage conservation, he has been appointed by government agencies in Hong Kong, Mainland and overseas as an expert advisor or a consultant for conservation projects and UNESCO World Heritage Site nominations. He is the Founding Vice-President of The Hong Kong Institute of Architectural Conservationists, Associate Member of The Hong Kong Institute of Architects, and Honorary Affiliate Member of the Hong Kong Chapter of the American Institute of Architects. Dr LEE currently chairs the Heritage Working Group of the Central Police Station Revitalisation Project and serves on the Urban Renewal Authority’s Planning, Development and Conservation Committee. Mr LEE retired from the office of Commissioner of Police in 2007 after 34 years of distinguished service, including several years at the former Central Police Station. Mr LEE was awarded the Gold Bauhinia Star Medal in 2007 for his outstanding public service. He is now Executive Director for the Hong Kong Institute for Public Administration. Mr Lee is a Member of the Heritage Working Group of the Central Police Station Revitalisation Project. Mr LO is currently the Chief Executive Officer of Hang Lung Group Limited and Hang Lung Properties Limited. He served as a member of the Board of Inland Revenue and the Committee on Financial Assistance Scheme for Family Members of Those Who Sacrifice Their Lives to Save Others under the Labour and Welfare Bureau, Hong Kong SAR Government. Prior to joining Hang Lung, Mr LO was Citi Country Officer and Chief Executive Officer for Citi Hong Kong and Macau. Mr LO holds a degree in Social Sciences from The University of Hong Kong. Received her doctorate degree from The Chinese University of Hong Kong, Professor MAN is the Director and Chair Professor of Academy of Film of the Hong Kong Baptist University. Professor MAN is a Member of Leisure and Cultural Services Department's Art Museum Advisory Panel, Expert Adviser of the Arts Capacity Development Funding Scheme under Home Affairs Bureau, Advisor for the Hong Kong Arts Development Council's Arts Criticism Group and Co-vice Chairman of the City Contemporary Dance Company. Professor MAN is a Member of the Art Working Group of the Central Police Station Revitalisation Project. Mr YOUNG is a District Councillor of the Central and Western District. He is the Vice Chairperson of the Food, Environment, Hygiene & Works Committee and a Member of the Culture, Leisure & Social Affairs Committee under the Central and Western District Council. Mr YOUNG holds a Bachelor of Arts Degree from University of Oxford and a Master of Science Degree from the London School of Economics and Political Science of the University of London. The Heritage Working Group assists The Jockey Club CPS Limited in providing comments and suggestions on proposed programmes, and offers expert advice on the content of the heritage programmes. Dr LEE is a founder and the longest serving Director (2006-2015) of the Architectural Conservation Programmes in the Faculty of Architecture of The University of Hong Kong. A well-published academic and an experienced practitioner in built-heritage conservation, he has been appointed by government agencies in Hong Kong, Mainland and overseas as an expert advisor or a consultant for conservation projects and UNESCO World Heritage Site nominations. He is the Founding Vice-President of The Hong Kong Institute of Architectural Conservationists, Associate Member of The Hong Kong Institute of Architects, and Honorary Affiliate Member of the Hong Kong Chapter of the American Institute of Architects. Dr LEE also serves on The Jockey Club CPS Limited Advisory Committee and Urban Renewal Authority’s Planning, Development and Conservation Committee. A surveyor by profession, Mrs BROOKE has been advocating developments in heritage conservation and sustainable built environment, serving a number of bodies, including the Heritage Hong Kong Foundation Limited, the Harbourfront Commission and its Task Forces on Hong Kong Island and Kai Tak together with Very Hong Kong Foundation Limited. Mrs BROOKE is Chief Executive Officer of Professional Property Services Limited. Mr CHAN is a Member of the Central and Western District Council. He is an active supporter for heritage conservation in the local community. He was appointed as a Justice of the Peace in 2000 and was awarded the Bronze Bauhinia Star Medal in 2012 for his community service over the years. Mr CHAN is a Member of the Antiquities Advisory Board. A town planner by profession, Mr LAM is an active supporter for heritage conservation and cultural development. He serves on a number of government advisory committees, including as Chairman of the Antiquities Advisory Board. Mr Lam holds a Bachelor of Science Degree in Urban / Regional Planning and Analysis from Buffalo State University in the United States. Mr LEE retired from the office of Commissioner of Police in 2007 after 34 years of distinguished service, including several years at the former Central Police Station. Mr LEE was awarded the Gold Bauhinia Star Medal in 2007 for his outstanding public service. He is now Executive Director for the Hong Kong Institute for Public Administration. Mr Lee also serves on The Jockey Club CPS Limtied Advisory Committee. Ms SIU received her Masters in Conservation from the University of York in the United Kingdom and Masters in Architecture from the Tsinghua University in Beijing. Ms SIU is an experienced museum curator and specialises in heritage conservation. Ms SIU is currently the Executive Secretary of the Antiquities and Monuments Office and the Adjunct Associate Professor of The Chinese University of Hong Kong. Dr TING is a well-known expert in Hong Kong history. He retired from the office of Chief Curator of the Hong Kong Museum of History in 2007. He serves on numerous boards and committees, such as the Council of the Lord Wilson Heritage Trust. Dr TING is a Member of the LCSD Museums Advisory Committee and Member of the Board of Hong Kong Palace Museum Limited. The Art Working Group assists The Jockey Club CPS Limited in the development of policy, provides comments and suggestions on proposed programmes, and offers expert advice on the content of the contemporary art programmes. The Hon CHAN is a deputy to the National People's Congress of China and the Convenor of the Non-official Members of Hong Kong's Executive Council. He is also a former member of Hong Kong's Legislative Council (1998–2008). A graduate of Pomona College in California, the United States, he is the President of Asia Financial Holdings Limited and Asia Insurance Co. Limited. He is Chairman of the Committee on Reduction of Salt and Sugar in Food, Chairman of the Steering Committee on Restored Landfill Revitalisation Funding Scheme, Chairman of Hong Kong Palace Museum Limited and Chairperson of the Hong Kong Council of Social Service. He is also Chairman of the Hong Kong - Thailand Business Council and an advisor to Bangkok Bank (China) Co. Limited. Mr CHAN chairs The Jockey Club CPS Limited Advisory Committee. Mr BATTEN is an active member of Hong Kong's art community as an art critic, curator and public commentator on art, culture, heritage and urban planning issues. He is a regular contributor to the South China Morning Post, Ming Pao Weekly, Artomity and Perspective and on television and radio. He is currently Convenor of the heritage and urban planning advocacy group, the Central & Western Concern Group; President of the International Association of Art Critics-Hong Kong; and, a non-executive Director of Rooftop Institute, a non-profit arts organisation linking Hong Kong and other Asian countries and territories. He ran his own gallery for many years; and between 2005–2015 organised the annual charity art event, Hong Kong ArtWalk. He studied history and social work at university and worked for a prisoner rehabilitation organisation in the 1980s. Mr CHA is the Chief Executive of Grosvenor Asia Pacific and has been a property investor and developer in the Asia Pacific region during his 20+ year career in the industry. Mr CHA has had a long standing interest in contemporary art and has been a long term supporter of the development of art and cultural institutions in Hong Kong. Mr CHA serves as Vice-chairman of the Asia Art Archive and is a Member of the Board of the M+ Museum for Visual Culture. He serves on the Asian Council of the Serpentine Galleries and previously served on the Tate Asia-Pacific Acquisitions Committee. Mr CHA has a Master Degree in Business Administration from Stanford University and a Bachelor Degree of Arts in International Politics and Economics from Middlebury College, the United States. 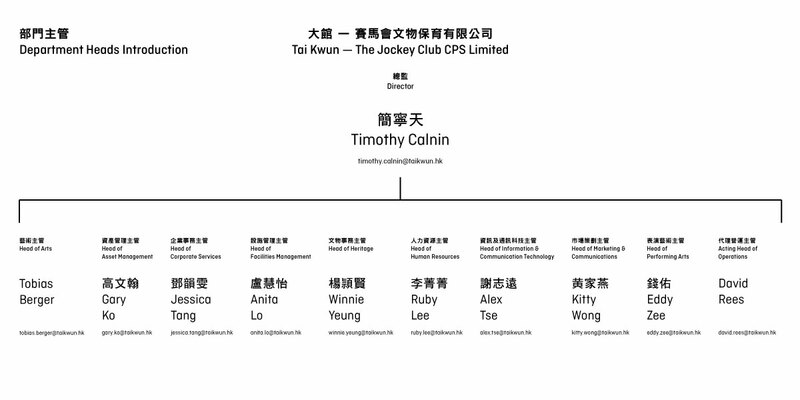 Mr CHA also serves on The Jockey Club CPS Limited Advisory Committee. Professor HO is currently the Associate Professor of the Department of Fine Arts, The Chinese University of Hong Kong. As a renowned local artist with artistic and academic achievements widely recognised by local and overseas art communities, he represented Hong Kong in various prestigious exhibitions worldwide including the 23rd International Biennial of Sao Paulo in 1996 and the 49th Venice Biennial in 2001. Professor HO obtained his Doctor of Fine Art degree from RMIT University (Australia) in 2003. Mr HUI co-founded 3812 Gallery with Mr Mark Peaker in 2011, and currently acts as Artistic Director. Mr HUI was a Member of Art Museum Advisory Panel, Leisure and Cultural Services Department, HKSAR (2014-2016); Advisor for the Arts Education Group, Hong Kong Arts Development Council (2014-2016), he was also a member of the Board of Governors of the Hong Kong Arts Centre (2009-2012). In 2013, Mr HUI co-founded various not-for-profit initiatives such as Arts in Heritage Research and SKETCH HONG KONG. In December 2015, he launched INK ASIA, the first international art fair specialising in contemporary ink art in Hong Kong. Received her doctorate degree from The Chinese University of Hong Kong, Professor MAN is the Director and Chair Professor of Academy of Film of the Hong Kong Baptist University. Professor MAN is a Member of Leisure and Cultural Services Department's Art Museum Advisory Panel, Expert Adviser of the Arts Capacity Development Funding Scheme under Home Affairs Bureau, Advisor for the Hong Kong Arts Development Council's Arts Criticism Group and Co-vice Chairman of the City Contemporary Dance Company. Professor MAN also serves on The Jockey Club CPS Limited Advisory Committee.